Jared Leto Joker Movie In Development | Nerd Much? It sounds as though Warner Bros. and DC intend to have two Joker properties hitting the big screen. Variety is reporting that the studios are going forward with a DCEU Joker movie revolving around Jared Leto’s take on the character as seen in Suicide Squad. Fans hoping to get some prominent screen time from the character in 2016’s bad guy team up were left disappointed. 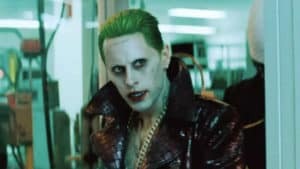 Jared’s role as the Joker was essentially an extended cameo, only being utilized to help flesh out the character of Harley Quinn. Leto has stated in the past that much more was filmed, however director David Ayer opted not to use it. There’s no details as to what the plot would revolve around as of yet. But Warner Bros. and DC intend to keep the character tethered to the Suicide Squad in some way. The studios plan to tie the Joker movie in with future installments of the Suicide Squad’s misadventures. A sequel has already been announced for that franchise, with production said to be set for sometime in 2019. It’s not altogether surprising that Warner Bros. and DC want to get this picture made. The character is immensely popular and the movie was substantially profitable. Suicide Squad raked in nearly $747 million at the box office on a budget of $175 million. In comparison, Justice League earned about $658 million with a budget of $300 million. This isn’t the only Joker movie said to be in the works though. Reports have swirled for quite a while that a Todd Phillips directed origin film is coming for The Clown Prince. It was rumored that shooting was to begin on that project in May with Joaquin Phoenix planned to take on the iconic role. May came and went though with no further information on the possible shoot. As with many of the DCEU properties at this point, we’ll have to believe this Joker movie is coming when we see it.